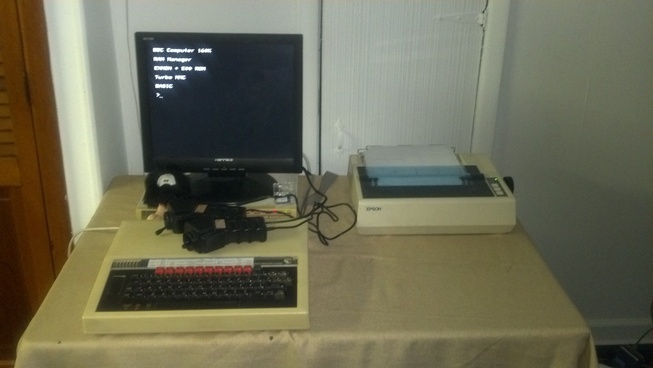 Back in 1983 or 1984 I got my first computer; a BBC Model B. This was a shared Christmas present with my brother. A few years later (1987?) I traded him my Amstrad stereo system for his half, so it was all mine. In the mean time I had expanded it with a Solidisk DDFS (1770 based) and a Solidisk SWR card; I tried a couple of variants before settling on the 2Meg128 card. This had 4 additional ROM slots and 128K of RAM. I'd also had an EPROM programmer and eraser and had built and burnt a few EPROMs. I'd written my own manager ROM (based off the STL code) and added the E00 DFS to the back of the EXMON code (both were 8K ROMs so I could store the E00 DFS in the 2nd half of a 16k ROM and add a command that'd copy it into a SWRam bank). When I moved to America I took the Beeb, one floppy drive and my floppies with me, but left my manuals, EPROM programmer etc etc behind. I'd never need 'em again! It took many years before I could actually use the Beeb properly, but I finally got hold of a composite-video to VGA converter that would work on PAL standards. Recently I found a thriving community of Beeb fans. One person has created a board that allows you to have ramdisk, USB, MMC and so on. On a Beeb! Another person has created a simpler MMC adapter. I got a varient of that. And so I found myself coding for the Beeb again. Once I got a MMC card card, the next step was to get data off my floppies. MMB files basically contain a bundle of SSD files. SSDs are 200K floppy images; 80 track single sided single density. Most of my floppes are double sided double density; 320K per side. Obviously won't fit! Also Solidisk uses extended catalogues to store more than 31 files per side. Further complication! This code allows me to get images of the larger disks onto a PC so I can then work with the files and build smaller SSDs from the results. This is a Unix TubeHost filesystem written in perl based around JGH's HostFS concept. It's basically a serial port filesystem for the Beeb! This is what happens when you take the TubeHost concept and combine it with a UPURS cable. Summary: connect the BBC User port to a PC serial port and then run a filesystem over it! Adding a second (and third) user port My attempts to build an expansion board that can add a 2nd user port to the Beeb. BASIC extension ROM Back in the day I wrote (or hacked up) a ROM that would extend BBC BASIC and add new commands and functions. So much fun from a 30 year old computer!